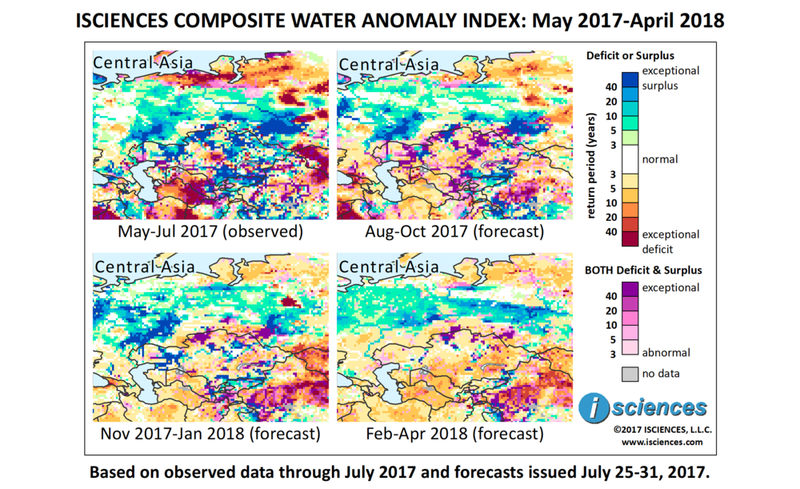 The 12-month forecast for the region indicates widespread surplus water anomalies in western Russia reaching exceptional severity; primarily deficits from the Yamal Peninsula in the north curving southeast past Lake Baikal and east across the Siberian Plateau; and surpluses in northern Far East Russia. Intense deficits are forecast for Turkmenistan, Uzbekistan, and into western Kazakhstan. Pockets of surplus conditions in Russia include the Upper Volga from Moscow to Novgorod, the eastern Volga Basin from Samara past Perm, and along the Ob River, particularly between the Upper Ob and Tom Rivers surrounding Novosibirsk. Surpluses are also forecast for northern and southern Kazakhstan and Kyrgyzstan. Heavy rains left 2,000 homes partially submerged near Vladivostok in southern Primorsky Krai in Russia's Far East along the Sea of Japan. Flooding and landslides affected 28 settlements in 5 districts, damaging bridges and roads, knocking out power to 20,000 homes, and halting rail service. On July 28 at 2pm a peninsula-wide blackout occurred in Crimea, triggered by temperatures reaching 39°C (102°F) in the Krasnodar region of Russia, which supplies electricity to Crimea. The automatic emergency shutdown created a 1,000-megawatt shortage on the peninsula. A state of emergency has been declared in Russia's Volgograd region and 6,500 emergency personnel have been deployed to combat fires. The Volga-Akhtuba flood plain has been extremely dry this summer, leaving one pumping station in Krasnoslobodsky completely without water and forcing firefighters to siphon water from the Volga River. Fires in Rostov-on-Don, in neighboring Rostov region, destroyed 120 buildings and left 1 person dead. 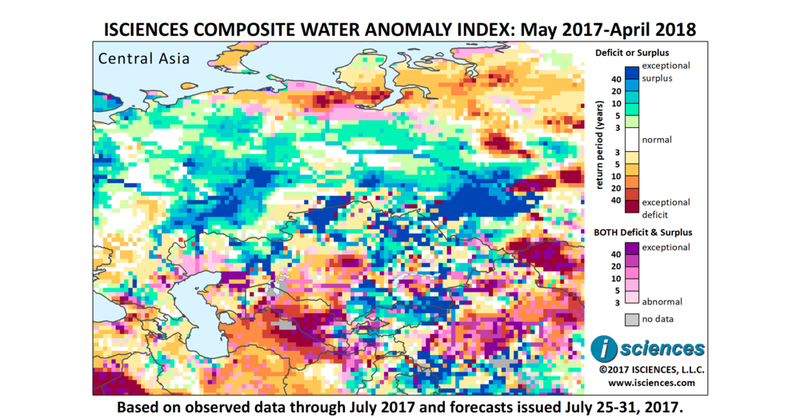 As seen in the map series above, water surpluses of varying intensity are forecast in Russia stretching from western European Russia to the Western Siberian Plain through April 2018. These surpluses are expected to be exceptional in large pockets of the Volga Basin and between the Upper Ob and Tom Rivers surrounding Novosibirsk from August 2017 through January 2018. The near-term forecast, August through October, indicates that prior surpluses in Kazakhstan will transition to conditions of both surplus and deficit as deficits emerge. Deficit conditions in Turkmenistan and Uzbekistan are expected to ameliorate, leaving modest deficits. Exceptional surpluses will continue to emerge in northern Kyrgyzstan, including Bishkek, while both deficits and surpluses are forecast for the Fergana Valley in the southeast and in much of Tajikistan. From November 2017 through January 2018 surplus conditions in Russia as previously described will remain much the same, though conditions west of Novosibirsk will transition to both deficit and surplus as deficits emerge. Surpluses in northern Kyrgyzstan will diminish very slightly but significant surpluses remain in the forecast for Bishkek. As deficits recede in parts of central Kazahkstan surpluses are expected to re-emerge east of Astana and in Aktobe Region. The forecast for the final months, February through April, indicates a recession of exceptional surpluses in the Volga Basin, the emergence of widespread moderate surpluses between the Svernaya Dvina (Northern Dvina) and Pechora Rivers, and an increase in more severe surpluses along the Middle Ob River. Deficits are predicted for Turkmenistan, Uzbekistan, and Kazakhstan.